At the end of the day, all participants in the stock market want one thing: Earning much money as quickly as possible. In the real world of the stocks this is often more difficult than expected. Behavioral finance teaches us to better deal with our emotions. Newcomers and inexperienced stock market speculators often follow senseless investment patterns on the greedy hunt for quick profits, follow market rumors without a smart investment strategy. In a long-standing process, every investor becomes more and more aware that there are no gifts to be distributed on the stock exchange. "There is no free lunch". Certainly not without the right strategy. But how good is the best strategy - if you do not follow it? Even if we have found a strategy that seems to promise great returns in backtests and works great for others, it often turns out to be very hard to follow strategy without mistakes. Responsible for this is the human psyche and emotions that each of us knows: anxiety, greed, hope, panic, frustration, cockiness and the tightrope walk between depression and megalomania. 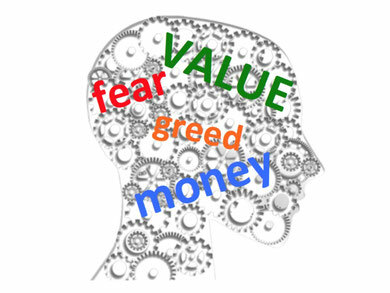 The field of psyche and emotion in the stock market deals with "Behavioral Finance". It describes and teaches us the irrational ways an investor goes when he is not causal and rational, but driven by emotions. Since not every decision on the stock market is causally hit, behavioral finance has a big impact on the stock market. However, emotional under and overreactions of the stock market is in conflict with the efficient market hypothesis. The efficient market hypothesis assumes that every piece of information is analyzed by the high number of participants in the stock market and every circumstance and that all data is fully priced into the stock price every time. However, research has shown that there are still inexplicable moves and the markets seem to be anything but efficient. If you are a follower of the efficient market hypothesis, you should not use the Fairvalue Calculator. Because the fair value calculator assumes that there are emotional reactions in the market and that not every stock is traded at the price which it is actually worth, but provide over- and underestimates for favorable buying or selling opportunities. Supporters of the Fair Value Calculator method just have to believe in the opposite, that markets are not efficient, so that not every stock is traded to the true value and not all information is causally and objectively priced into the stock price. The occurrence of stock market bubbles or calendar phenomena such as the "January Effect", show that the theory of market efficiency is lagging. How could the financial crisis develop in 2008, when all participants know everything and interpret everything correctly and always invest properly? With good reason, the market efficiency theory is increasingly in distress. Here efficient market theory seems counterfactual and reaches its limits. With this growing conviction, the importance of behavioral finance is also increasing. The one who has a successful investment strategy, should also be able to implement this strategy without the influence of emotions. This requires a strong set of rules, a planned procedure and discipline. To get around this human errors the fair value calculator method is not only of finding undervalued stocks, but at the same time a strong mental support. With the Fair Value Calculator Method you know the true value, always buy cheaply, and even if the price goes lower, you know that the true value of the stock is higher, and wait. So you can rely on your strategy in difficult times. This prop works as long as you stick to it and under no circumstances deviate from its strategy. Limiting profits and unstopped losses are the most common mistakes on the stock market. The explanation for this lies again in the Behavioral Finance, so in the psyche of the people: If the price rises quickly, you are already satisfied with a small return and feel confirmed and you take the profit. However, in the case of a quick loss, people tell themselves that the loss is only temporary and that the stock will recover. Man refuses to admit mistakes and realize the losses. Again, the fairvalue calculator method works better. By referring to the fair value of the stock and the annual fair value update you should make for your stock, will always let you know where the true price approximately is and you have a fixed clue in all the confusion, anxiety, panic and emotion. Of course, the fair value calculator method does not guarantee safe profits, but it could increase your chances of getting a better return. Does a value strategy beat the market? What is the fair value? Due to my 13 years of experience on the stock market, I am aware of the psychological risks myself. Too often I have caught myself in stupid mistakes due to emotions. With the help of the Fair Value Calculator method, I have developed a model that works well on studies and backtesting and also supports the investor in important decisions through the exact set of rules. In the comments section below this article, you are welcome to bring in criticism, praise or suggestions for improvement. We are happy about every contribution and like to discuss, no matter what. Leave a comment and we will gladly answer. Access to more than 90.000 Fair Values! Disclaimers: fairvalue-calculator.com is not operated by a broker, a dealer, or a registered investment adviser. Under no circumstances does any information posted on fairvalue-calculator.com represent a recommendation to buy or sell a security. The information on this site, and in its related newsletters, is not intended to be, nor does it constitute, investment advice or recommendations. The experts may buy and sell securities before and after any particular article and report and information herein is published, with respect to the securities discussed in any article and report posted herein. In no event shall fairvalue-calculator.com be liable to any member, guest or third party for any damages of any kind arising out of the use of any content or other material published or available on fairvalue-calculator.com, or relating to the use of, or inability to use, fairvalue-calculator.com or any content, including, without limitation, any investment losses, lost profits, lost opportunity, special, incidental, indirect, consequential or punitive damages. Past performance is a poor indicator of future performance. The information on this site, and in its related newsletters, is not intended to be, nor does it constitute, investment advice or recommendations. The information on this site is in no way guaranteed for completeness, accuracy or in any other way. With the Use of the Portfolio Manager you don´t actually buy stocks with real money. You just get the Information of how a stock portfolio could be compiled. To follow the instructions on this side is no guarantee for success on the stock market. Stock investments are risky and can cause financial damage or lead to money losses.